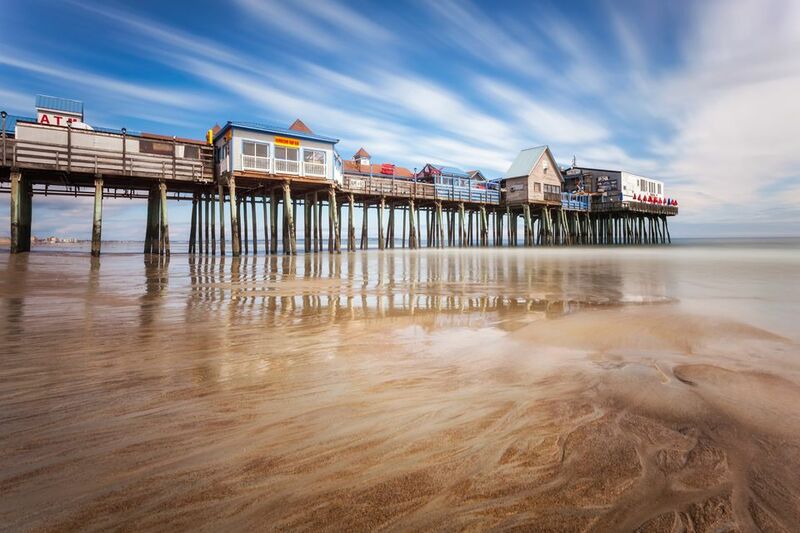 Have you heard of Old Orchard Beach? As New England summer beach destinations go, it's not as well known as Cape Cod and not quite as crowded as Hampton Beach or the beaches along the Rhode Island shore. That means this seven-mile stretch of sand in southern Maine is the perfect choice for those who seek not only the amusements typical of a family beach destination but the chance to claim more than a towel-sized piece of beach as their own. If you are familiar with Old Orchard Beach, you likely immediately think of The Pier, which has been the center of activity for the beach resort since the original pier was built in 1898. On hot summer days, the area surrounding The Pier is as densely packed with ocean lovers as any beach in New England, but the beauty of Old Orchard Beach is that it stretches on and on—for about 3.5 miles in either direction of The Pier—and as you move away from this epicenter, you will share the soft sand and sea with fewer and fewer folks. Even more beautiful: All of Old Orchard Beach is open free to the public. Free Information: A free Old Orchard Beach Vacation Planner is available online in English or French. One reason the area surrounding The Pier is most popular is that Amtrak's Downeaster stops at a railroad station just diagonally across the street from The Pier, allowing visitors from Boston and Portland to escape to the beach without the need for a car and without fighting traffic along I-95. There is no other beach in New England that is this easily accessible by rail. Traveling to the beach by train is also a nostalgic way to arrive. Trains brought visitors to Old Orchard Beach from 1842 until the mid-1900s, but the town was without an active station for many years until Amtrak's Downeaster debuted in 2002. Speaking of nostalgia, Old Orchard Beach is undergoing a bit of a transformation these days, as efforts are underway to tone down the honky-tonk reputation of The Pier and to recapture some of the seaside town's Victorian-era charm. The focus is on creating an inviting atmosphere for families, and while The Pier is still home to amusement rides, carnival games, arcades, temporary tattoo stalls, bars and food stands, the town's goal is to become a year-round resort community. You may be wondering if the water is cold. While it's certainly chillier than what you'll find at more southerly beaches, it's certainly tolerable for getting your feet wet or taking a quick dip, and kids don't seem to mind the brisk ocean temperatures at all. In addition to playing at the beach and on The Pier, the Old Orchard Beach area offers many family attractions, dining options and shopping opportunities for vacationers. Attractions include the Funtown Splashtown USA waterpark, fishing charters, golf and miniature golf courses, lighthouses and more. Portland (Maine's largest city) and the outlet stores of Kittery are both a short drive away. During special annual events at Old Orchard Beach, such as Back to the Beach Corvette Weekend or the annual Beach Olympics, there are even more diversions to fill your days. Nights are fun-filled, too, as Old Orchard Beach puts on a free fireworks display near the pier every Thursday evening from late June through late August. Concerts are performed most summer weekends on Saturday or Sunday evenings at the Ocean Park Association Temple. Winter is a hushed time at Old Orchard Beach, but more and more hotels are extending their seasons into the spring and fall and some do remain open year-round for those who crave a quiet oceanside escape. From Labor Day through Memorial Day, you'll find attractive off-season rates. The hotels, motels and inns along Old Orchard Beach are all independently owned and operated. That means there is quite a bit of variety when it comes to quality, price and amenities. There are many hotels right on the seven-mile beach, which makes getting to the ocean a cinch. However, since the beach is long, many are not walking distance from the amusements centered around The Pier. Be sure to ask individual properties about their exact location, cancellation policies, check-in times and facilities. You'll find some more predictable chain hotels a few miles away in Portland and South Portland. For rentals, be sure to ask if linens are provided. Camping can be an affordable alternative for family vacations. Location: Old Orchard Beach is located along Maine's southern shore, just about 100 miles and a two-hour drive north of Boston. The beach is just 12 miles or a 20-minute drive south of Portland, Maine. Directions: From Boston and points south, follow I-95 North to exit 36 in Maine. Follow I-195 for 5 miles. Just after a Rite Aid pharmacy on your right, you will arrive at a three-way intersection with a stop sign. Take a right, proceed down the hill toward the ocean, cross the railroad tracks and when you reach The Pier and the sign welcoming you to Old Orchard Beach, either turn right for West Grand Avenue or left for East Grand Avenue. From points north, Follow I-95 South, the Maine Turnpike, to exit 36 and proceed as above. Parking: Most hotels offer free parking for guests, so if you're planning an overnight stay, you may want to select accommodations within walking distance of The Pier. For day visitors and those staying further out, parking near the Pier is readily available but can be a bit costly during the peak summer season. A tip: Jimmy's Oceanside Parking at 25 West Grand Avenue includes use of restrooms and changing facilities with your parking fee. Taking the Train: The Amtrak Downeaster stops in Old Orchard Beach, depositing guests right across the street from seven miles of sand and all of the amusements at The Pier. The Downeaster offers five round trips daily between Boston and Portland, Maine, making a day at the beach an easy trip for travelers from those cities and stops along the route. Two of these round trips extend to Freeport and Brunswick, Maine, each day.